Special Edition Electrolux Ultrasilencer Vacuum | OhGizmo! The Ultrasilencer from Electrolux is apparently one of the quietest vacuums on the market (that actually has some sucking power) and the company has recently announced a ‘special edition’ version that was customized by designer Pia Wallén. Presumably that’s her on the right, and not Sarah Electrolux, a fictional person I just made up who invented the electrolux vacuum. 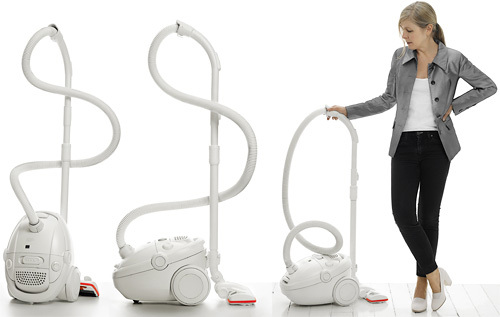 Her inspiration for the stark white design actually came from how quiet the vacuum really is. “It reminded her of the most beautiful sound she knows – the sound of falling snow.” Personally, I prefer the sound of one hand clapping, or a tree falling in the woods when I’m not around to hear it. And to be honest I’m not sure how much ‘design’ it really takes to remove all the color from an existing product (or add all the colors for you science-types) but if you prefer your home to have that ultra-modern look, you should really think about swapping that old Hoover for one of these. The Ultrasilencer was released on September 20 in the UK, October 1 in Norway and Finland and October 5 in Sweden. Unfortunately though, there’s no plans to release it in North America. Actually all us science types will tell you that it’s only additive colors that combined give white. Additive color is what you have on monitors etc. But on a “real life” thing the colors are actually subtractive, which means that if you add all colors you get “black”. I added the ‘science types’ quip since I’m sure someone would have called me out on it. And once I added that I realized that someone else would call me out on the additive/subtractive thing too.